* Special note regarding CGs: Chiaki's Sequel only contains TWO CGs. You earn one in the happy ending and the second one is found in the happy ending epilogue. The normal end does not contain a CG. 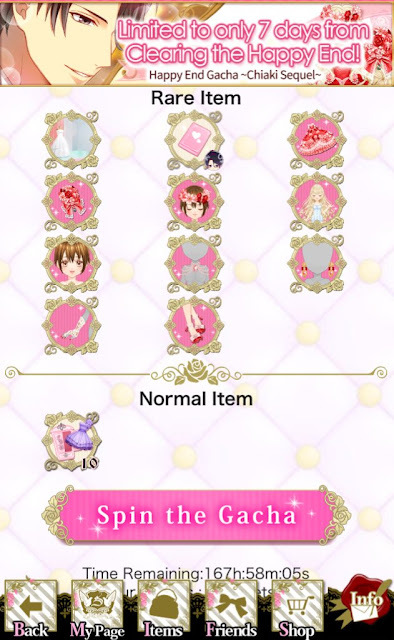 * If you wish to receive the Happy Ending, please know you will have to purchase +10 Chiaki Sequel affection or earn +3 affection through the "Kissing Chiaki" gacha. I thought you were teasing me. But it's hard to communicate. What do you mean useless? I will not keep quiet! * You will have to purchase +10 Chiaki Sequel affection to receive the Happy Ending.